When I first heard the news that my friend’s father had died, I didn’t know what I could possibly say to ease her grief. Instead of trying, I offered to bring her family dinner. I hoped that in feeding her family, she would feel my love and support. I hoped that in saving her the time to shop for groceries and prepare food, she would have more energy to take care of herself when so many others were leaning on her. I hoped that by offering a comforting meal, food might help her when — really — nothing else could. I am not alone in feeling this instinct to reach out with food; countless others set up and join meal trains — collective efforts to feed and nurture those in need — every day. When people we love go through transformative moments — the death of a loved one, serious illness, or bringing a new child into the world — we reach out to help them settle into new life patterns. Sometimes we can connect with sage and comforting advice, but when we can’t, food is usually a welcome offering. Decide Between Home Made or Prepared Options. A homemade meal prepared with love that can be easily heated and served is usually the favorite option, but if you don’t like to cook or don’t have the time, don’t kill yourself trying to make something yourself. If you have a hard time pulling off dinner for your own family, preparing a meal for someone else can feel like a burden rather than gift. Picking up or having take-out delivered — especially from a friend’s favorite spot — is a lovely alternative. Find Out About Food Allergies, Preferences, or Other Dietary Restrictions. Even if you feel sure you know what a friend’s family can eat, food needs change, especially if you are bringing food to a nursing mother or someone with a serious illness in the family. Always double check. If you’ve signed up to bring meals through a site like Meal Train or Food Tidings, this information is usually listed prominently. If not, just ask. If a friend is undergoing chemotherapy, being mindful of what you bring can be especially important. A cancer-survivor shared that “tastes can change – some people’s palates becomes metallic, or they have dry-mouth, or feel nauseous much of the time.” Consider checking your library for cookbooks specific to cancer patients. Both The Cancer Fighting Cookbook or One Bite at a Time by Rebecca Katz come highly recommended. If you know a family has food restrictions, including a list of ingredients for each item that you bring will circumvent concerns or problems. Plan Your Menu. There’s only so much lasagna a person can eat in one week, right? Since certain dishes are easier to transport than others, these meals get repeated frequently. If you rule out the first few recipes that come to mind, you’re probably on the right track. If delivering, remember that pizza is often the first idea that comes to mind for many people. One new mom mentioned receiving pizza for three meals in a row! Most meal delivery planning websites allow you to check what others have delivered or plan to deliver around your selected date. If not, it’s easy enough to send a quick text or email, but don’t feel disheartened if you don’t get a response. Many friends mentioned that the best deliveries they received were “complete” meals. In addition to main dishes, people appreciated receiving items like a simple salad, a side vegetable, or a loaf of French bread. And while it’s certainly not expected, almost everyone I talked with said that something sweet for dessert or a bottle of wine made them feel extra pampered. As you plan, be sure to consider foods that will hold well in the refrigerator or that can be frozen in case they can’t be eaten right away. When delivering home-prepared meals, be sure to include clear and detailed instructions for re-heating or other necessary prep, for example, “toss goat cheese and dressing before serving.” When possible, keep items on the side that diners can add themselves, especially when delivering food to a family with kids. Homemade or purchased build-your-own-dinner options work well for families with food allergies, sensitivities, or picky eaters. While planning to leave a family with leftovers is certainly not expected, many people expressed their gratitude about having extra for lunch or dinner the following day. One new mom recounted how she felt hungry all the time. She loved how “it was so convenient to pull a slice of whatever was leftover from the fridge, microwave it, and eat quickly after putting the baby down to sleep,” especially in the middle of the night. Another friend dealing with a long-term illness decided to place a cooler on her porch where people can leave meals if no one is home. She leaves clean containers in the cooler for people to pick up after a few days if they want them back. Additionally, other meal preparers can swing by and pick up containers for their own meal deliveries instead of adding the expense and waste of using disposable items. Honor Your Commitment. When a family knows dinner is taken care of, the weight on their shoulders feels a little bit lighter. If that dinner doesn’t show up — when they’re hungry and without a plan — that weight feels suddenly heavier than it should. One evening, some friends waited and waited after the scheduled drop-off time, but food never arrived. They felt too embarrassed to contact the person who signed up and scrambled to get dinner together for themselves. If you’ve signed up to bring dinner but find yourself unable to so, make alternate plans as quickly as you can. Switch days with someone else if you have time or simply have take-out delivered. One day when I was supposed to prepare dinner for a friend, I woke up with a high fever, so I had pizza and a salad dropped off from their favorite restaurant. I felt guilty sending a pizza (see “Plan Your Menu,” above), but since I couldn’t get out of bed myself, it was the best I could do. If nothing else, let your friends know that something has come up so they won’t be counting on dinner. Without exception, all the families I talked with, no matter what their circumstances, expressed how the simple act of being fed made them feel supported and connected during a challenging, hectic, or exhausting time. One friend recounted a story about a friend who felt extremely isolated while undergoing cancer treatments: “The homemade meals she got were like receiving cards in the mail – they were thoughtful and so much fun to ‘open. '” So remember, whenever you deliver food to a friend in need, be it homemade or prepared food, an elaborate spread or simple fare, your efforts to nourish the body will feed the soul as well. 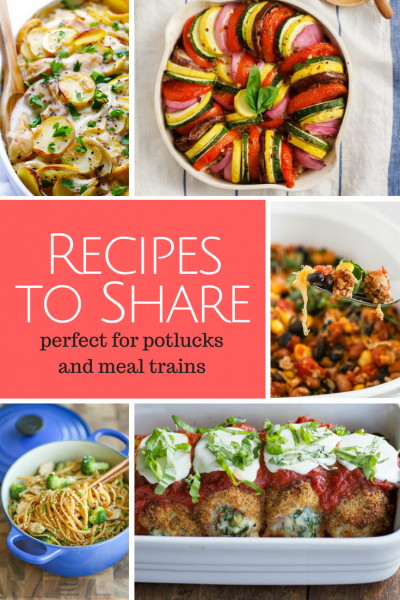 Here are some tempting, delicious recipes to help you get you started thinking about how to keep the meal train rotation new and interesting for families. Make it a complete meal by adding a simple salad or side vegetable. For a special treat, throw in a bottle of wine or something sweet. 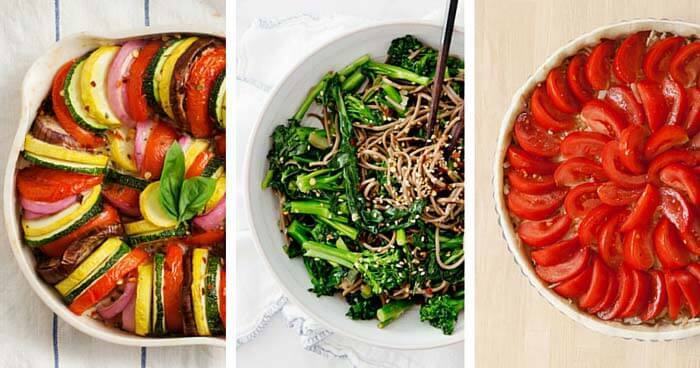 For additional inspiration, check out our 50+ Beautiful Casseroles round up or our collection of 50+ Fall Soup Recipes to Soothe Your Soul. This post was written by Suzanne Cowden exclusively for BonBon Break Media, LLC. Suzanne focuses on food as centerpiece for both everyday routines and special occasions. Each recipe featured on Flour Arrangements, from simple loaves of bread to fondant decorated birthday cakes, comes with a story that blends life with cooking. 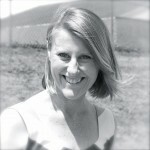 Suzanne lives in the San Francisco Bay Area with her husband and daughters.